My shop items have been getting a lot of love lately in Etsy Treasuries. I decided just to share these couple that popped up over the week because they are sooooo bright and fun for summer! Enjoy! The Brightness of Summer by Vintiques & Company, featuring my Vintage Trippy Mushroom Tray. Daisies in the Mix by With Love, Ruby and featuring my Vintage Flower Tray. It’s the hardest part of any DIY paint project. Well, that and doing everything while the baby sleeps! Luckily the paint can dry in between naps and I don’t go to crazy in the meantime. Hanging with the Little Guy always takes my mind off all the work I have to do around this place. The priming is complete and I am waiting for the swatches of wall color to dry. While I am trying to make a decision about which colors to use I plan to get a couple of coats up on the ceiling. Lord knows when the last time that thing saw a fresh paint job. It’s funny how white things seem until you paint them with a fresh coat of white paint. As soon as the chair rail got a hit or two from the brush after I splattered primer I could really see the distinct difference in colors. Can’t wait to get the ceiling and all that trim cleaned up! In addition to the wall color I need to make a decision about curtains. 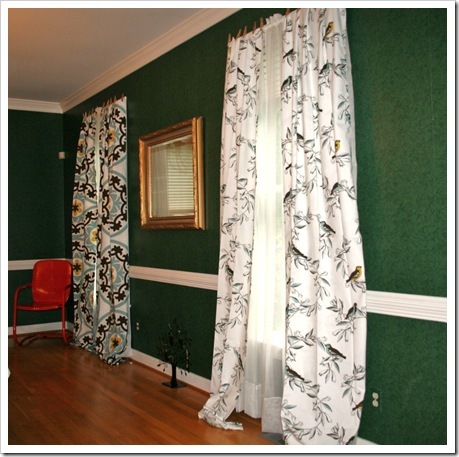 Since this room is large I thought about going bold with a fun patterned fabric for the stationary panels I plan to put up high and wide along all three windows in the room. The real privacy will come in the form of bamboo roman shades. So, I was perusing Target the other day and came across the new table linens from Dwell Studio. As always, I was drawn right in by their use of color and fun pattern. I was also lured by the size of the largest tablecloth, 60” X 104”, which is exactly the size I need for these windows. 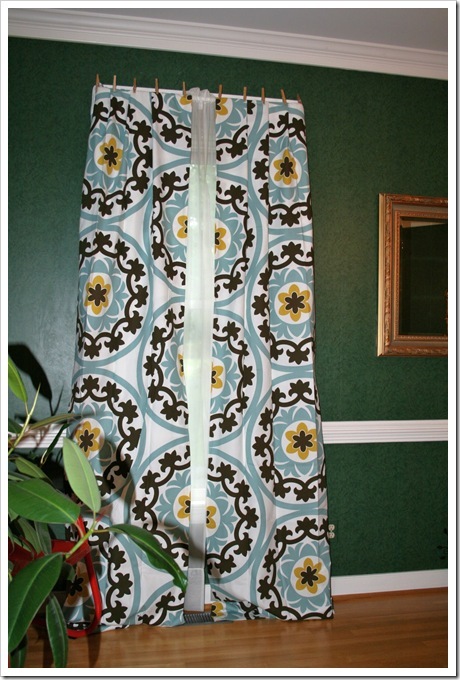 Unfortunately, finding the longer sized curtains in the ready made world of window treatments has proven very difficult. If, and that is a big IF, I find a ready made panel that I like it either doesn’t come in the larger size or that size is super expensive, or it’s out of stock. 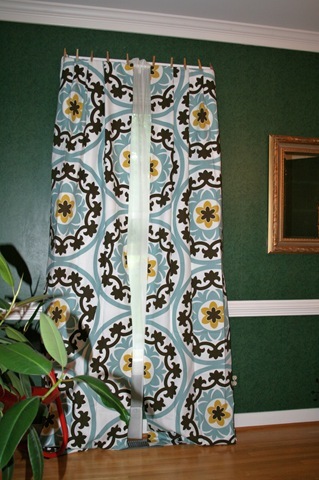 That was my luck up until recently in searching for curtain panels. Until I walked into Target that fateful day. I left with just enough tablecloths to make curtains for the dining room and adjoining living room. Now I just need to choose which to use in each room. Here are some shots of the dining room pre-DIY disaster with the curtains held in place via clothespins over the sheer panels the previous owners left. 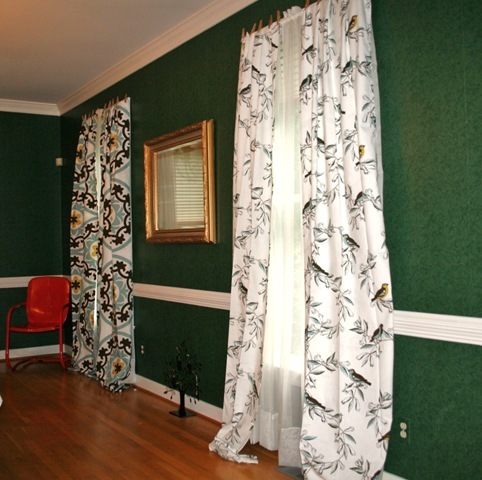 Usually I do not like a lot of bold pattern, so I may end up just using one set in the dining room (since it’s a larger space) and going with plain fabric for the living room. Both linens use the exact same color combo of chocolate brown and deep blue gray with an occasional bit of mustard thrown in for contrast, all on a white background. 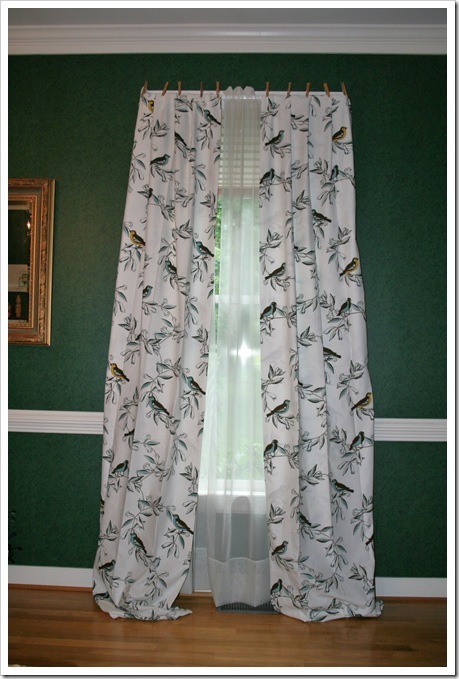 My plan is to put up white wooden curtain rods with rounded finials that sit above the window and just below the crown molding. I also want the rods to hold the curtains outside of the windows on either side, just overlapping at the trim and up to the edge of the bamboo shades I plan to hang for privacy. I am curious to know what you guys think. So far everyone that I have asked has picked the same style with the comment, “This one looks like you”. What is funny is that I was leaning toward the opposite design. So, let’s see what you all think, “looks like me”.